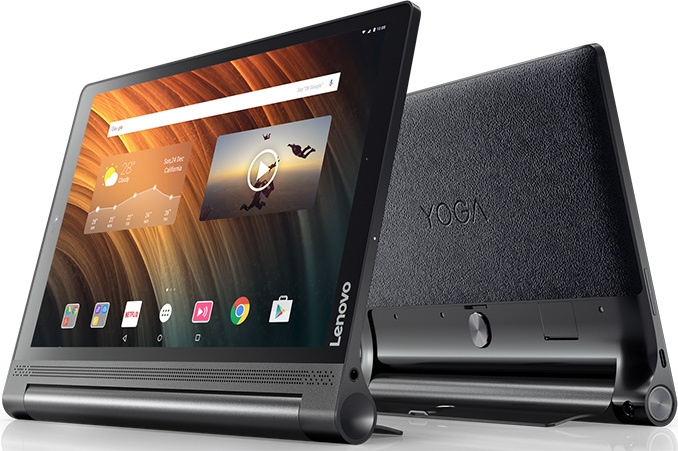 Lenovo has introduced a new member to its Yoga Tab 3 product family this week at IFA. The new Yoga Tab 3 Plus tablet runs Google Android 6.0 and is aimed at demanding consumers. The novelty comes with a number of features previously only available on the Yoga Tab 3 Pro, including a higher-end octa-core SoC, a 2K 10” display, a lot of RAM, plenty of storage as well as Wi-Fi 802.11 ac connectivity. Surprisingly, the Yoga Tab 3 Plus will not be too expensive and will be available starting from $299. When Lenovo introduced its Yoga Tab 3 family of products last year, the company drew a clear line between its mainstream Yoga Tab and considerably more advanced Yoga Tab 3 Pro tablets. The former were based on entry-level SoCs and were equipped with relatively low-res screens and limited amount of DRAM/NAND, whereas the latter were powered by Intel’s Atom SoC, were equipped with 2560×1600 displays and featured considerably better specs in general, but at a much higher price ($499/$599 for Wi-Fi/Wi-Fi+LTE model). Today, the Yoga Tab 3 closes the gap between the two product lines and attempts to wed the best of both: affordable price and high-end specs. The Yoga Tab 3 Plus is based on the Qualcomm Snapdragon 652 SoC (4×A72 1.8 GHz, 4×A53 1.4 GHz, Qualcomm Adreno 510 graphics) and comes equipped with 3 GB of LPDDR3 DRAM as well as 32 GB of NAND flash storage (it also has a microSD card slot). The tablet uses USB Type-C (operates in USB 2.0 mode) connector for charging and connectivity and also supports WiFi 802.11 a/b/g/n/ac, Bluetooth 4.0 and LTE (optional) wireless technologies. 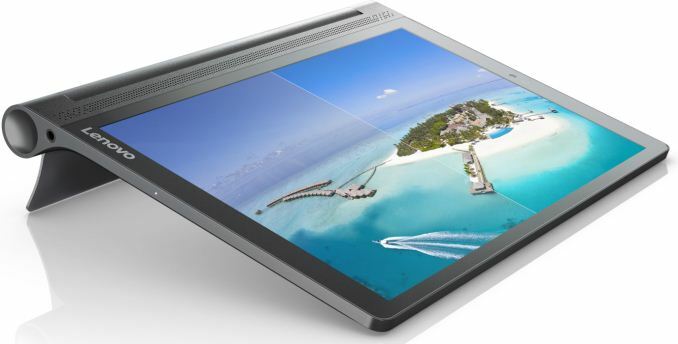 Model Yoga Tab 3 8" Yoga Tab 3 10" Yoga Tab 3 Pro 10" Yoga Tab 3 Plus 10"
Lenovo positions its Yoga Tab 3 Plus tablet for those, who want to have enhanced multimedia experience on-the-go, which is why its 10-point multitouch 10.1” WQXGA (2560×1600) IPS display comes with Technicolor’s color enhance software technology. In addition, the device is equipped with four front-facing speakers (made by JBL) and supports Dolby's Atmos 3D surround sound processing. Now, unlike the Yoga Tab 3 Pro, the Tab 3 Plus does not feature a pico projector, but just like the aforementioned model, it has two cameras. Battery capacity of the novelty is 9300 mAh and Lenovo claims that the Yoga Tab 3 Plus will last up to 18 hours on its battery. As it turns out, slightly lower battery capacity of the Yoga Tab 3 Plus compared to the Yoga Tab 3 Pro is offset by better energy efficiency of its SoC, which is why it promises to deliver similar battery life. Besides long battery life, the Yoga Tab 3 Plus also inherited premium chassis featuring metal, plastic and leather from the Pro model. Lenovo will start shipments of its Yoga Tab 3 Plus this October. The MSRP for the Wi-Fi-only model will be $299, but the recommended price of the LTE SKU is currently unknown. No IR Blaster? Guess I'll be sticking to my Samsung Tab S 8.4" still. Had a Logitech Harmony remote, returned it after it was bugging out and kept resetting itself as if it was never used before, and forces you through a tutorial before it can even be used again. It was a pretty common complaint according to Amazon reviews for that particular model. Then, I returned it for a different model which apparently was a used and returned product repackaged and sold as "new" by a 3rd party seller on Amazon, and I stopped trying to even attempt to use any Harmony garbage after that. The Smart IR Remote app has worked out much better for me, although I've had to manually setup remotes for devices that didn't have official remote profiles for some of my equipment.